Cats are very clean pets and they manage their own thing, but you need to offer them the best cat litter boxes if you want to ensure proper hygiene for them as well as your home. While cats are taught by nature to cover their scent, they can usually be quite fussy about where they “go”, and you might be surprised to see that some litter boxes simply won’t do for your pretentious pet. The good news is that there are lots of models to go for, from simple designs to enclosed units and even automatic litter boxes that do all the work for you. The best way to find the right unit is to check some of the top cat litter boxes reviews so you get to start with some of the most appreciated products for your beloved cat. Litter pans come in many shapes and sizes so you want to make sure you purchase the right one for your furry friend. There are also durability considerations to take into account, size, as well as cost. 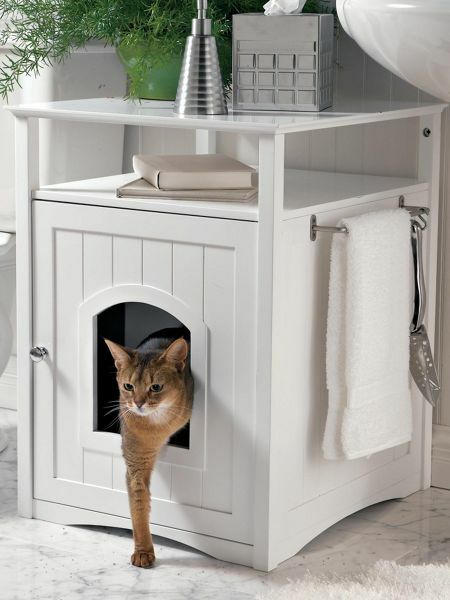 When it comes to price, you can find litter boxes for every pocket so you can surely find a model that suits your preferences and budget. When it comes to choosing from one of the many good cat litter boxes on the market, you might find the task to be a lot more difficult than you’d expect. This is because you get a lot of options such as normal plastic trays, boxes with a roof, automatic litter boxes, and even disposable ones. Finding the best will also depend on the preferences of your cat. If it’s the shy type, you might want to go for an enclosed litter box so you can enable your cat to do its business in total privacy. If you aren’t exactly a fan of scooping the litter too often, a robotic model is ideal. There are also size considerations, and you want to ensure that the box you are getting won’t be too small or too large for your kitten. Finally, you need to take other aspects into account, such as durability and ease of use. The most straightforward type of litter box can sometimes be the best choice, especially if you have an unpretentious cat that wouldn’t object to a basic tray. You should make sure that you buy the right size for your cat since a model that’s too small will result in messy litter scattering and unpleasant odors to deal with. A model that’s too large will occupy more space than necessary and possibly be harder to clean. Most models are made from hard and durable plastic materials which ensure that they can last for a very long time. Some even come with non-stick surfaces which enable you to clean the litter easy and fast so that you don’t have to spend too much time on what is most likely not one of your favorite activities. An open litter pan usually comes at a low price, and you still have a few variants to select from. You might want to go after a model with high sides, especially if your cat loves digging litter all over the place. If you don’t want an open tray for various reasons, then an enclosed model is one of the best cat litter box alternatives. These will offer your cat more privacy and eliminate disturbances or distractions as well as control unpleasant odors. Another advantage is that an enclosed box will prevent litter spread so you won’t have to sweep the entire room after your kitty decides to “dig in”. These models are also ideal for outdoor use since they will keep other pets out and ensure that you won’t get any rain or debris from spoiling the litter. Some units are equipped with doors, which make these even better at preventing nasty smells from affecting your home. You might also be interested in a model with a filtration system with carbon or other elements to filter out odors as well as decrease the amount of dust, making for very clean solutions for your cat and your home. Some roofed boxes also come with doors and handles, the latter being extremely useful for transportation. If you’re looking for a low-maintenance alternative for your cat’s needs, then an automatic model is one of the great cat things you can buy to make your life a lot easier. You won’t have to dread scooping litter several times per day anymore since these modern units will take care of everything so you don’t have to. These usually have fast self-cleaning cycles which ensure a safe environment for your pet and no work on your behalf. These ingenious devices come with filtration systems to remove unpleasant odors, a sifting mechanism to separate litter from waste and a special compartment where the residue is collected, and the robot will let you know when you need to take it out via an indicator light. 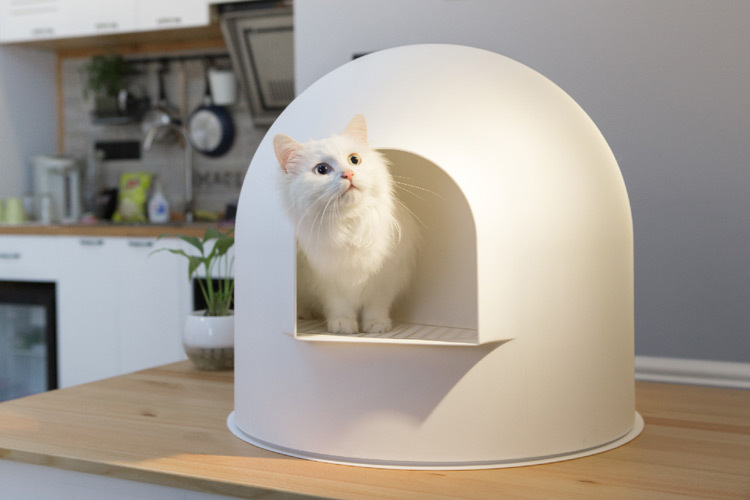 Some variants for sale have an open-air design while others come with roofs and even automatic doors which sense when your cat wants to use the box or wishes to leave. These automatic litter boxes also enable you to set the timer to 5 or 10 minutes so that you allow the cat to do its thing without stressing it out, although it has been reported that some cats actually enjoy watching the litter box robots perform self-cleaning. Another popular choice for cat lovers is the disposable litter box. Made of recycled materials such as paper, these are usually impregnated with baking soda which neutralizes unpleasant odors. These make excellent cat litter boxes for small spaces, although you can also find jumbo sizes for extra large cats. However, these units are quite sturdy and will not shred or leak so that you can use them for two to four weeks and throw them away afterward. You don’t have to worry about pollution either since these are 100 percent biodegradable so they’re perfectly safe for the environment.